Hiya guys! Is anyone else loving this autumn weather? It definitely puts a pep in my step when I get to put on a hoodie. In theme with that, I'm actually breaking away a little bit from the Halloween madness today. To change things up a little, I'll be sharing some beautiful Fall-perfect shades. The swatches I am showing you are for three of the six holographic polishes from the Sweater Weather collection by Liquid Kandi. Cause you know, there is never a bad season to sparkle. Scientific fact right there guys, haha. 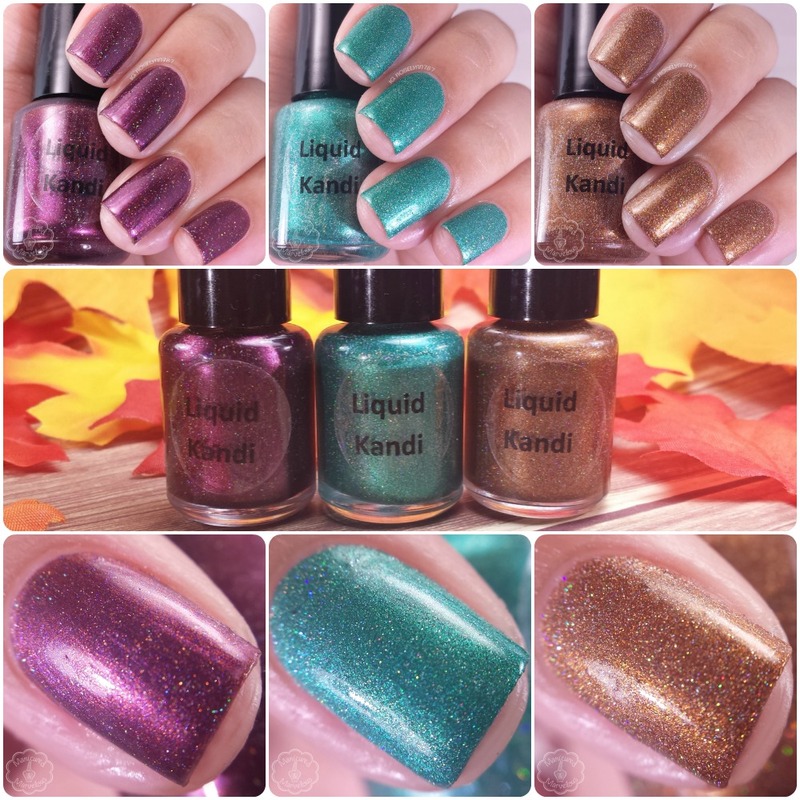 The Sweater Weather Collection by Liquid Kandi is available now for purchase individually and as a complete collection. Each full size bottle retails for $10.00 each while the mini sizes go for $4.00. You can also purchase the entire full size collection for $56.00 and the mini variation for $22.00. 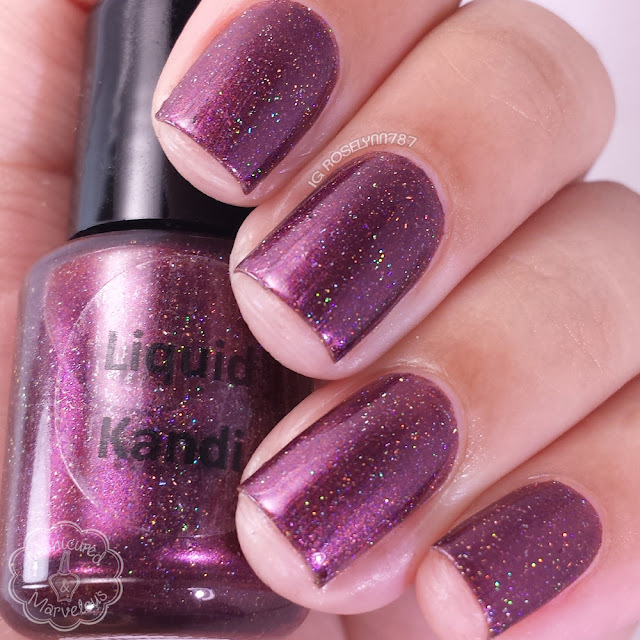 Apple Cider Afternoon can be described as a maroon polish with micro holographic glitter. I feel like this is such an uncommon shade for me to wear, but it really goes well with this season. I ended up liking it so much that I wore it for a few days and the wear was fantastic. I was especially impressed by how the finish remained in full holo effect throughout three to four days. Formula was a bit sheer on the first coat, but it ends up building up quite nicely. It dries to a smooth finish with a bit of visible brush strokes. Shown here is three coats sealed with a glossy topcoat. 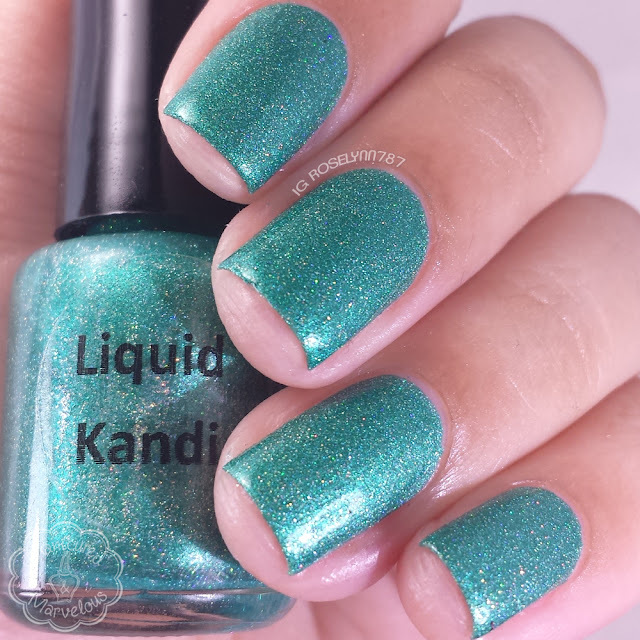 Don't Leaf Me can be described as an emerald green creme with holographic micro glitter. Again, it's another shade I don't feel overwhelmed with in my collection. Definitely my favorite shade wise from the three you're seeing here. The formula was a great consistency, not too thick or too thin. Had the perfect amount of coverage in a single coat, really opaque and smooth. Unfortunately I did experience some minor staining from this polish in the short amount of time I wore it so it'll probably be a safe bet to double up on a base coat. The finish can end up drying a little bit gritty as well, but that was easily smoothed out with a thick layer of topcoat. Shown here is two coats sealed with a glossy topcoat. Cinnamon Apple Pie can be described as a bronze magnetic creme polish with micro holographic glitter. Love, love, love this shade! It just feels so rich and yet very delicate in tone. The formula and consistency are identical to that of Don't Leaf Me. The earthy tone ends up being extremely opaque, which was a nice surprise for me. Again here the finish ends up drying a bit gritty on its own. Shown here is two coats sealed with a glossy topcoat. Overall I really loved the color selection in each of these for Autumn, they definitely hit the inspiration square on. Rich colors with easy formulas are always a nice thing to have. This is especially true if you're like me and don't have anything similar in your collection. With the bit of staining aside, Don't Leaf Me was definitely a major favorite for me but then again Cinnamon Apple Pie is also a clear winner. Which one is your favorite? Lovely colors and beautiful swatches!! So beautiful, I love all the scattered holo glittah!! Don't Leaf Me is beautiful. These are all lovely but I really love Cinnamon Apple Pie! I agree with your assessment that the brown wins the show here!